Celebrity chef David Chang boldly proclaimed that pho is the future of the American noodle—he’s not wrong. 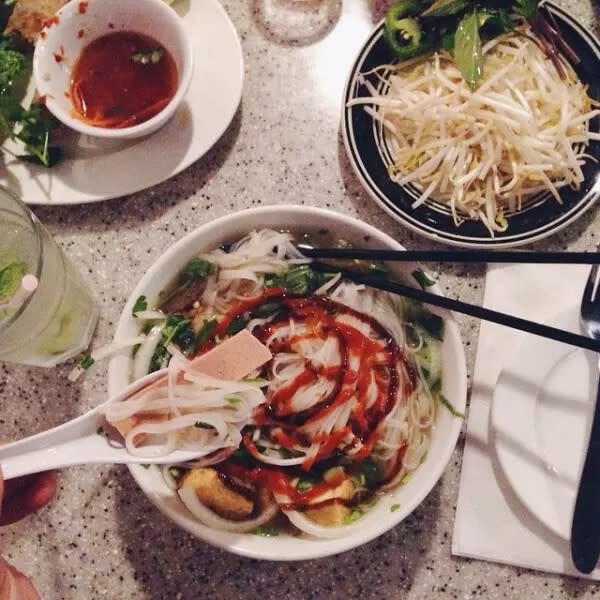 In the neighboring city of Westminster, Little Saigon’s streets are home to countless shops dedicated to the Vietnamese comfort food. 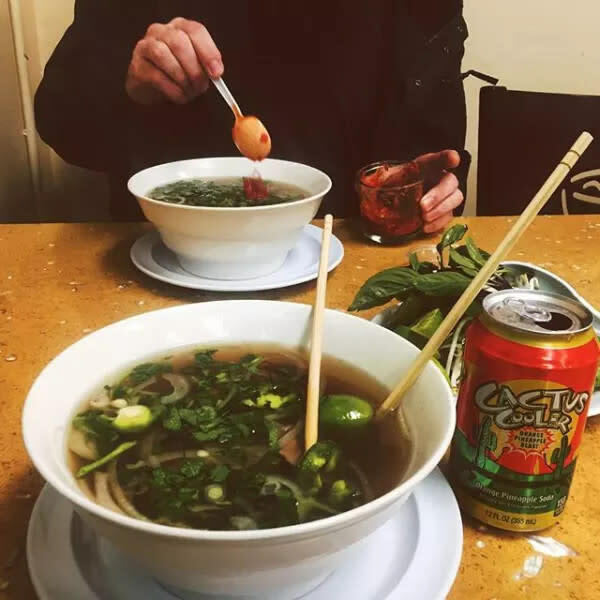 It’s a dish steeped in cultural history, but a growing mainstream interest in exploring global cuisine has brought pho into the culinary spotlight. 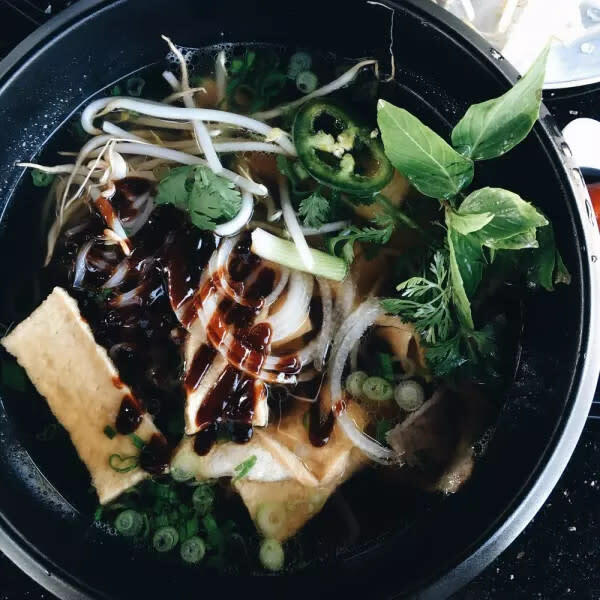 Whether you’re dining in one of the new eateries popping up across Huntington Beach or enjoying soup prepared by a home chef, it’s easy to agree on one thing: A good bowl of pho all depends on the broth. Often simmered for upwards of 10 hours, the fragrant liquid develops a deep, savory flavor that sings when paired with chewy rice noodles and traditional toppings of beef or chicken. As generations passed, the simple dish evolved. 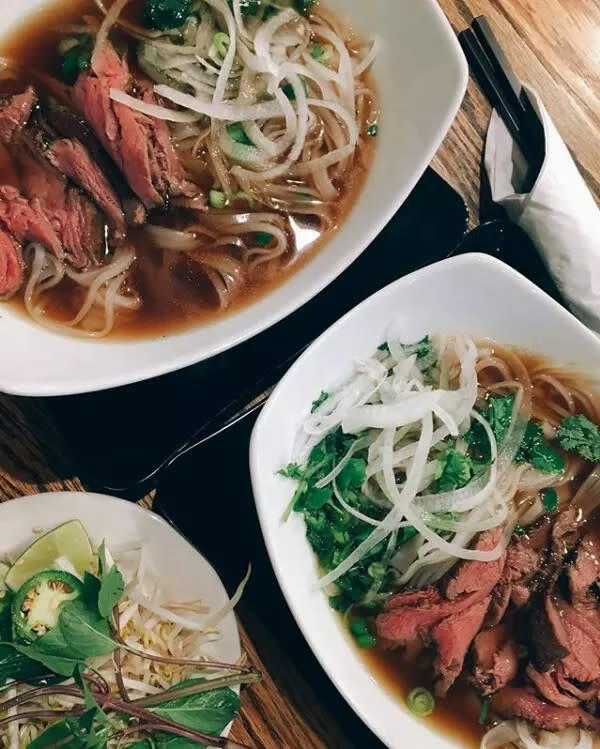 Today, it’s not uncommon to find diners adding sprouts, basil, lime and swirls of Sriracha and hoisin sauce—just another sign of pho’s widespread popularity. So with a soup spoon in one hand and chopsticks in the other, dive in and enjoy a steaming bowl of this soulful noodle soup at four spots across Huntington Beach. Located across from Westminster Mall, this small shop offers a modern ambience and a counter-service menu that’s straight to the point. Choose from Angus steak, brisket, meatball or tofu, grab your utensils and take a seat at one of the eight or so tables in the enclosed patio. When a piping hot bowl is placed in front of you minutes later, breathe in the heady aroma of the broth and enjoy pho in its simplest form. PHOTO FROM YELP USER REBECCA V.
While most pho restaurants have perfected the art of pho bo (beef), Pho Tastee serves up a superb chicken soup. White breast meat provides familiar comfort along with a light, balanced broth that dances easily over the palate. Take your food to go for a nominal fee—the restaurant, located at Beach Boulevard and Garfield Avenue, has limited seating. A trendy venue in the Target Plaza at Beach Boulevard and Heil Ave., Silk Noodle Bar’s most unique feature is a stainless steel machine that churns out fresh rice noodles daily. Invented and built by the restaurant’s owner, the machine is proudly displayed in a corner of the dining room. 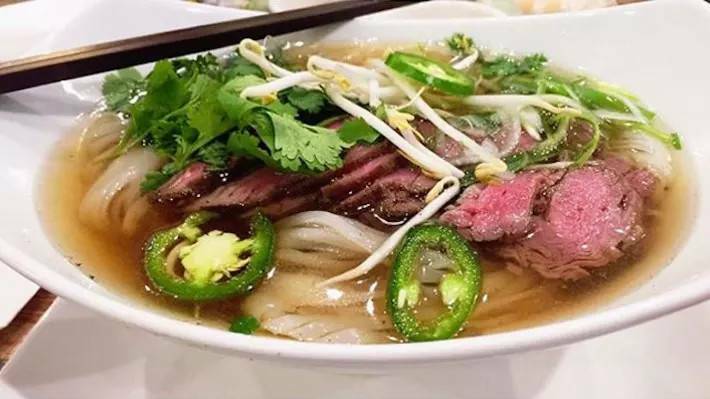 The housemade noodles are slightly thicker and flat, but provide a nice parallel to the heartier cut of meat in the popular filet mignon pho. This vegan and vegetarian hot spot is just a stone’s throw away from Bella Terra. Save your veggie cravings for this intimate restaurant, known for its crispy tofu and faux meat dishes. Noodles are served in a vegetable broth that’s light yet surprisingly flavorful. Soy chicken or beef are topping options carnivores seeking a suitable substitute, but many diners would suggest the fried tofu. With sprouts and basil, it adds a textural depth to the simple noodle soup.